Mrs. G and I love salmon, but sometimes we get bored with it and want to shake it up a little bit. 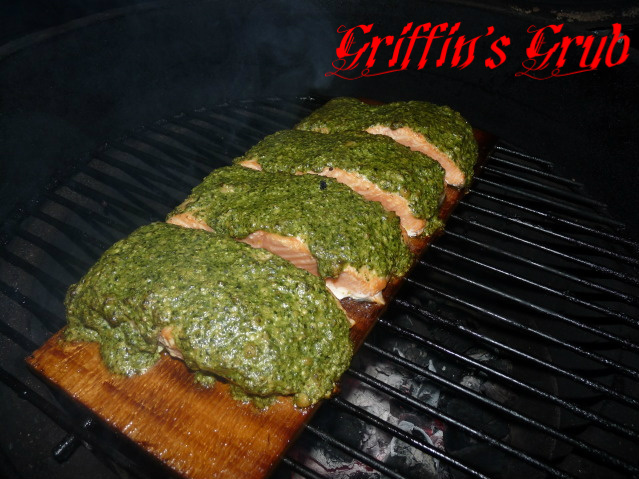 We were discussing what to do with it, when Mrs. G suggested pesto-crusted salmon. I had never had it before and had some doubts, but she said she had and it was good, so full steam ahead. I’m not going to go into how we cooked the salmon, we’ve covered that already. And I wish I could share some great pesto recipe with you. I know they aren’t difficult to make, but let’s be honest, by the time I got to the grocery store, I was already tired and I wanted to relax and spend some time with my wife that night and the prepared stuff at the store looked good and wasn’t that expensive. Hey, we can’t have everything home-made all the time, can we? 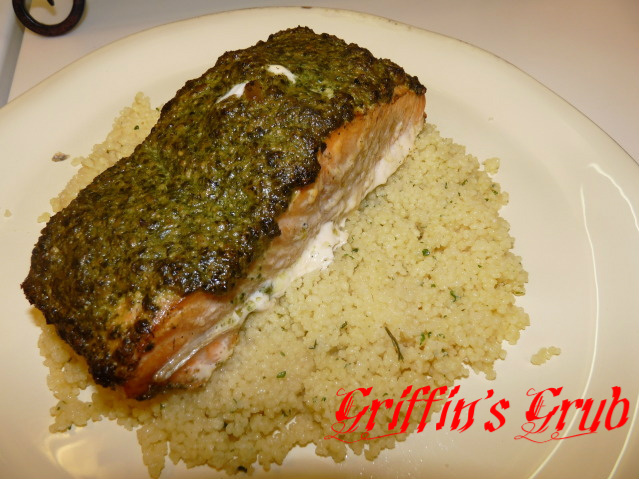 We served up the salmon with some roasted garlic and olive oil couscous and a side salad. 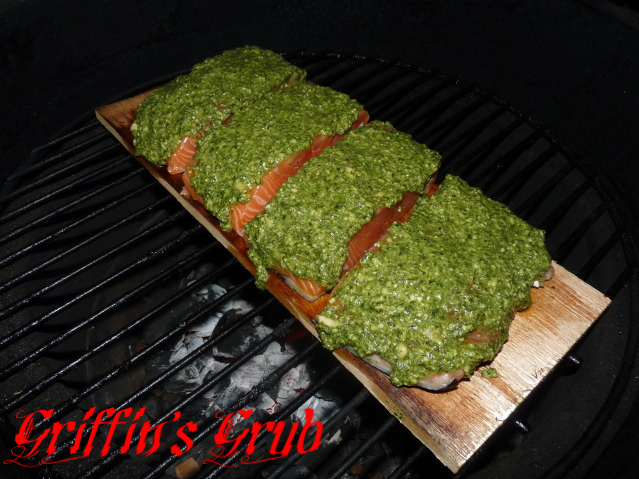 Even though I was skeptical about the pesto on salmon, I have to admit it was really tasty and will become a new item in our rotation. It won’t replace regular ole salmon, but when we want to change things up a bit, I’ll do it again. And maybe next time I will actually make the pesto from scratch…..
And yes, for those of you wondering, my wife is still in New York. This dinner was actually cooked last Friday, I just never got around to posting it. Since you used a jarred sauce, that made me think about Classico’s line of pesto and their sun dried tomato one. That might be really good with salmon. I bet it would, Chris. Thanks, being a Texas boy and hailing from Corpus, I’ll never turn down Whataburger!